It’s a summer Sunday in Porto. A logical move – going for a stroll along the oceanfront. Living in a city by the sea, one can hardly think of nicer way to spend a sunny weekend morning! So, here I am in the neighbourhood of Foz, where the river meets the ocean, and which, within the city, has a distinct cultural identity. 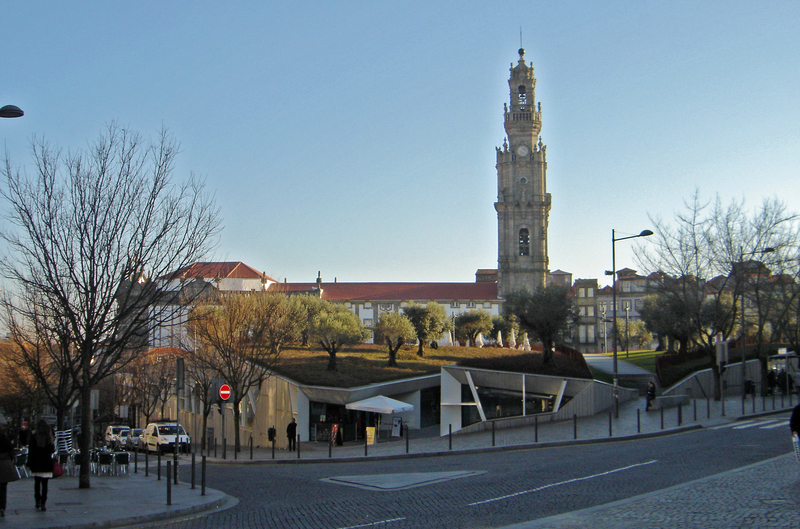 Foz is among the most desirable locations to live in Porto, and those of us whose residences are elsewhere love coming here over and over again, for strolls, festivals, gastronomy or nightlife. This Sunday, it seems all the city strollers decided to unite: the streets of Foz are turning into rivers of people! And it seems the strollers have taken over the roadway, too, as cars cannot pass. Hmmm, what might this be all about? People line up in the shade along the sidewalk, and the music starts. I approach, too, with my camera ready to register this curious event I stumbled upon. And here they come: dozens of ladies and gentlemen, bishops and kings, children, maids, fishermen and their wives, in a parade that revives local traditions, ways of life, monuments, and reminds of prominent people that marked the history of Foz. As if we have gone back in time: they are all dressed in beautiful, elaborate, colourful, sometimes even theatrical clothes from the epochs long gone. The parade doesn’t seem to be very disciplined: here and there, participants step out to wish a good day to a friend or to take a photo or two for their family albums. Quite a few approach to greet an elderly lady who has chosen a nice, shady spot right next to me. Being the participants just steps away, I realize: those wonderful dresses and suits, all the equipment and details, even their shoes, are all made of paper! I find out that I am in the middle of the celebrations of St. Bartholomew, traditional of Foz, and that the paper suit parade happens to be their highlight. Some claim the tradition is over a 150 years old, others say that it goes just 50 years back, and that it became constant from the early 1990s. I won’t be investigating much into the dispute: maybe it is for the best not letting the truth get in the way of a very nice story! The parade ends in the sea, but not all the participants dare to have a swim. Despite it is late summer, the ocean is unpleasantly chilly. The bravest ones dip in the ocean in their paper suits until they fall apart. This summer day in Porto remains so unique and memorable: the parade theme and the paper suits will be reinvented over and over in the years to come, yet in my mind there is nothing ephemeral about this Sunday. 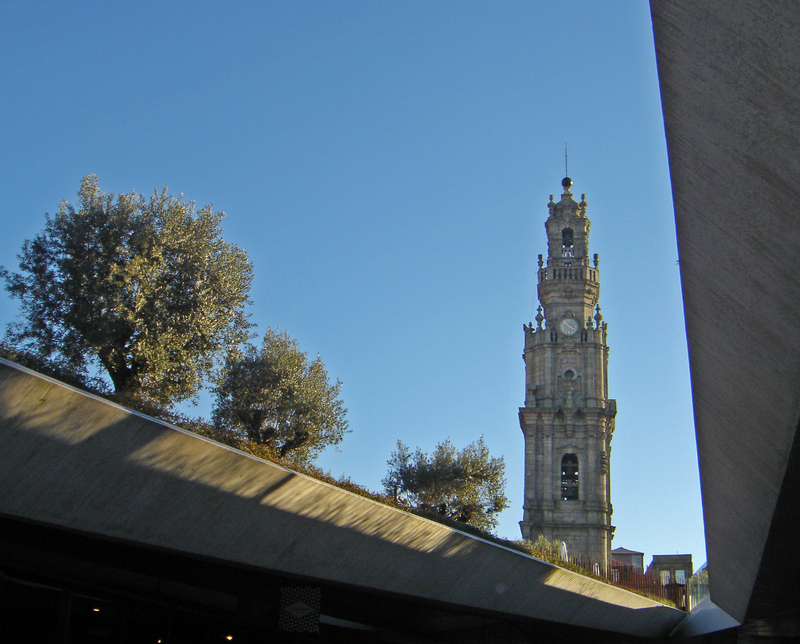 Lately, the Saturday afternoons I spend in Porto are booked: they are dedicated to new discoveries related to the city’s cultural landscape. The discoveries touch Porto’s natural environment, the man-made structures and features, and the character and values of its people. Yes, this article is about the new, third edition of Um Objeto e Seus Discursos, that goes on from the beginning of March all the way to December here in Porto. The idea is simple: meeting weekly at a different place, with a different group of interesting speakers, whose starting point for a talk is an object significant for the city and its history, be that history distant or quite recent. Thanks to this initiative, I have already had an opportunity to visit some spaces normally inaccessible to public and learn lesser known facts and episodes about Porto. And after two years, there is still so much to uncover about its cultural landscape. The 2016 discoveries started with food: the history of “tripas à moda do Porto” was addressed, but it wasn’t all – the typical dish of Portans could be tasted as well! And there is so much to look forward to! 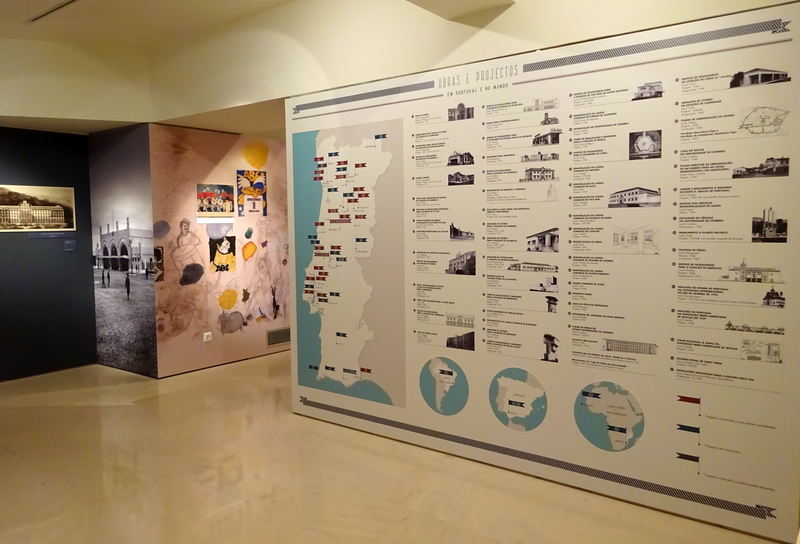 I am especially curious about visiting the Palacio da Bolsa, where Gustave Eiffel’s desk is kept, finding out if one of the bodies buried in the Clerigos church really belongs to Nicolau Nasoni (there is archaeological research ongoing), or discovering lesser known details of Porto’s urban history through a visit to over a century-old public toilets. A little belated, though, but I hope two days don’t mean that much of delay for a proud hundred-year old! 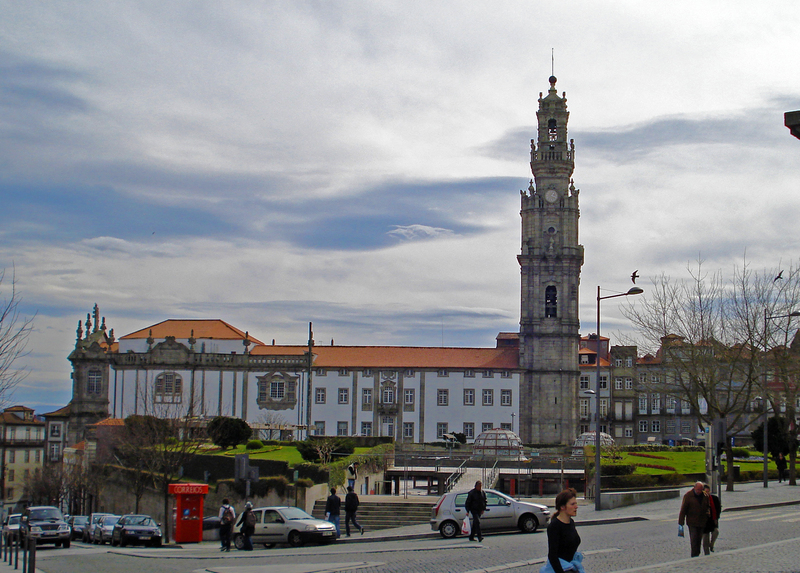 On February 1st, 1916, the works on the new city avenue, today known as Avenida dos Aliados, began in Porto. The importance of the work can be illustrated by the fact that the very president of Portugal of the time, Bernardino Machado, was present. 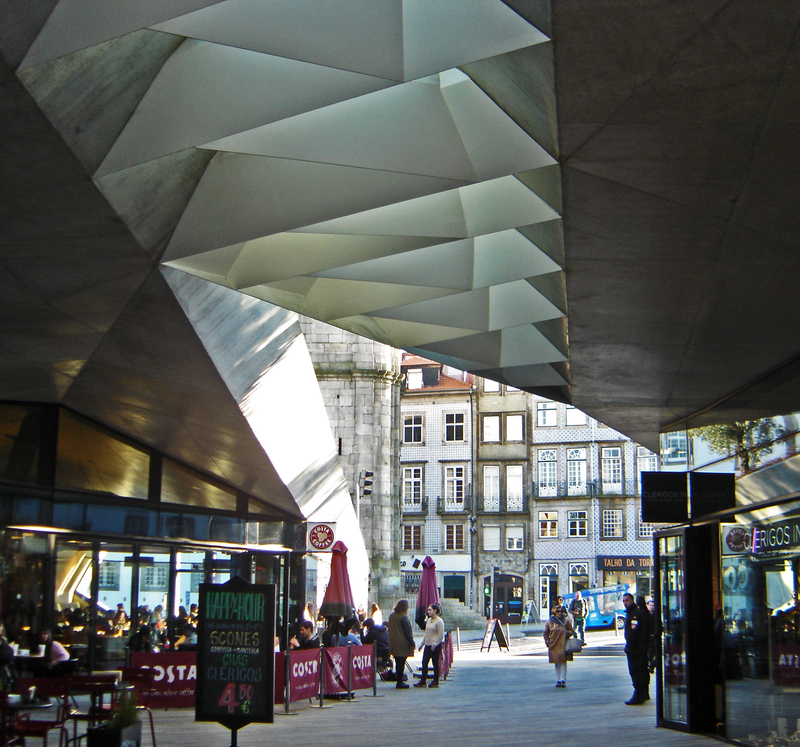 On a second glance, it becomes clear that one of the most well-known public spaces of Porto is actually composed of three spaces: the Liberdade Square, the Humberto Delgado Square, and the Aliados avenue. The idea to create a grand public space dates back to the beginning of 18th century: the role model was the main square of Madrid, Plaza Mayor. But the full conditions to conduct the works and create the Aliados avenue as it is known today were reached only in the first decades of the 20th century. Its construction began with a demolition: the space had been intersected with several streets and contained built structures … and orange orchards! So, on February 1st, 1916, the ancient city hall building, that was situated in the southern part of today’s Aliados, defining one of the façades of the Liberdade Square, began to disappear. Each square meter of the avenue, the squares and the surrounding buildings tells a story of Porto’s architectural and artistic trends, social life and economy over the last century. Among many important names that contributed to it, I would like to point out three: Barry Parker, Henrique Moreira and Álvaro Siza. Parker was the author of the green gardens of Aliados many Portans still remember, suffer for and idealize a little bit. Siza, together with Souto Moura, changed the square to what it is today: maybe it could be less grey, but the city needed a paved space for huge public gatherings, and the eclectic architecture of its “façades” finally came under the spotlight. The third gentlemen, Henrique Moreira, has given much of a soul to Aliados: he is the author of two sculptures situated there, the Youth (known also as The Girl of Aliados) and the Abundance (or The Boys). Here we are in the Lisbon’s district of Belem, approaching the white tower, built exactly 500 years ago to defend the Tagus estuary. 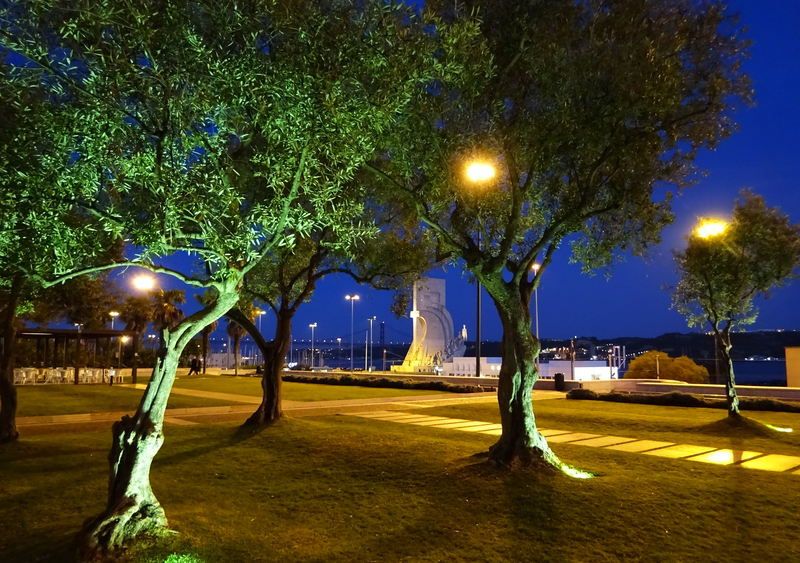 The concrete jungle and asphalt rivers of Lisbon coexist with the serene park and the breezy walkway along the Tagus (Tejo) shore, just a few dozen meters away. The wide river promenade was once a setting for an important exhibition: “Portuguese World Fair” took place there in 1940, just at the time when the rest of Europe … well, had other things in mind. At the starting point, in front of the Belem tower, an unfocused gaze quickly centers at a stone caravel: this is the area from where Portuguese ships departed to explore the unknown continents, back in the epoch of discoveries and glory. 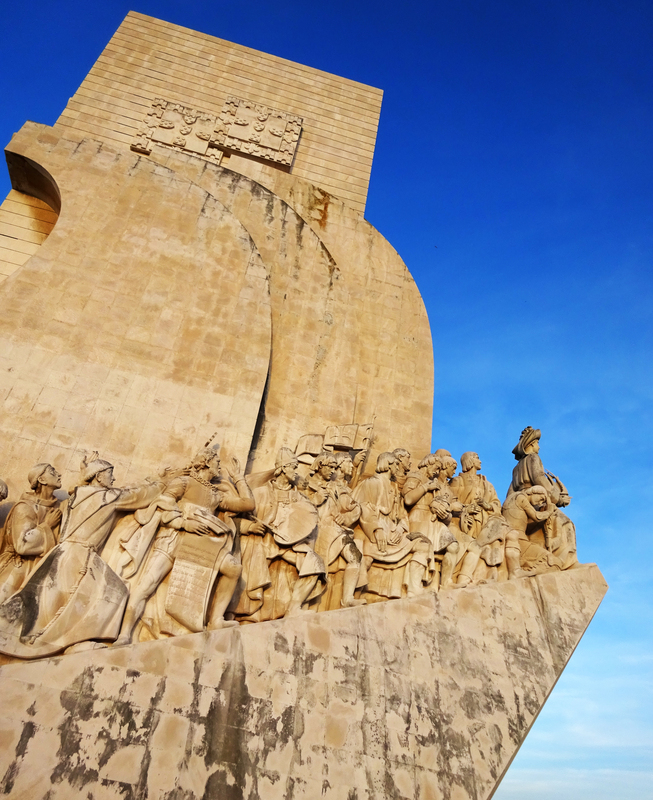 The Monument to Discoveries was built on the occasion of the mentioned Fair: Henry the Navigator and many other famous Portuguese of those times are sculpted in stone, with heroic expressions and brave postures, reflecting also romanticization of the epoch and its admiration by the then regime. 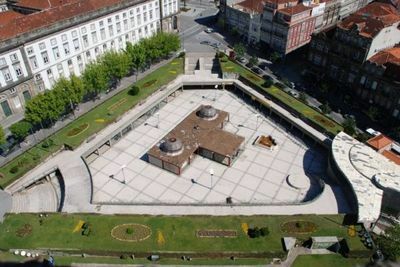 However, the structure we see now is not the original one: the monument designed by the architect Cotinelli Telmo in 1940 was not meant to last at all. Like most other exhibits for the Portuguese World Fair, it was conceived as an ephemeral structure of metal support and gypsum coating, to last one summer. And so it was, after a while, in 1943, the monument was demolished, though some politicians found it a very powerful symbol of the nation’s aspirations and wanted to keep it. There is evidence that the architect himself was against its reconstruction (however, I couldn’t find more details on that issue). But, he didn’t live to see it reconstructed. In 1948, he died after an accident – while fishing, he was dragged by a wave that crashed him against a rock. 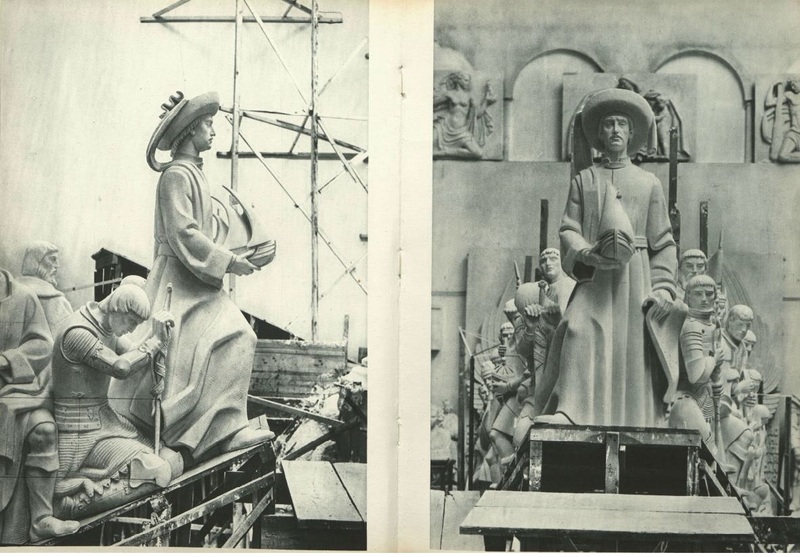 All the others thought reconstructing the monument would be great, once the idea was revived in the late 1950s. And so, in 1960 (on the occasion of the 500th anniversary of Henry the Navigator’s death), it was rebuilt in concrete, dressed with stone, and given some extra functions: exhibition space, auditorium and a viewing terrace on top, to become one of the most visited sites in Lisbon of today. 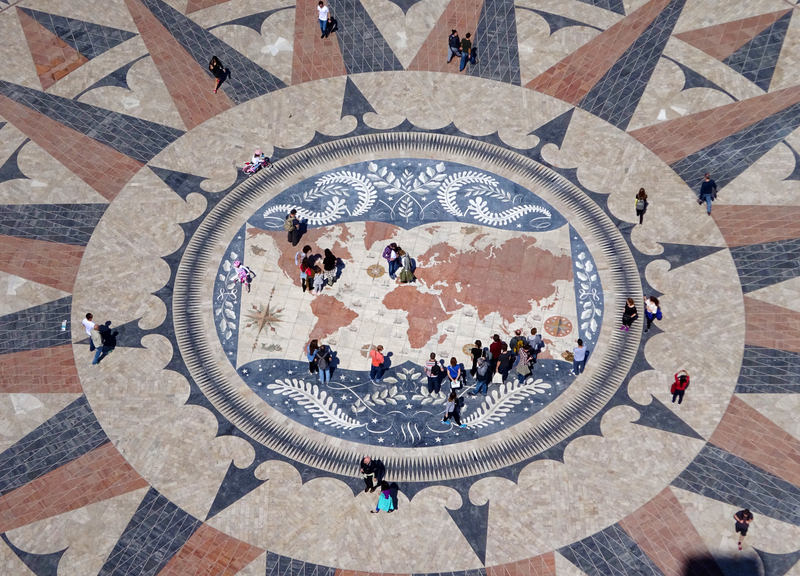 The square in front was decorated with a marble wind rose and a world map depicting Portuguese discoveries, a present from South Africa. In fact, the history of the monument is all about the political decisions, that made possible both creation of the first, ephemeral one, and building of the present structure, revived in stone. Outliving the poor architect and the Salazar’s regime too, the monument is today symbolizing pride of the glorious Portuguese 15th and 16th centuries. And more universally, facing the unknown and making the world change. Many Portuguese, not to mention foreign tourists, don’t know the above facts. I am happy to have found out this story in an exhibition on life and work of Cotinelli Telmo, that has just ended in the very monument’s exhibition space. Photo credits: 1st – from the 1960 brochure issued on the occasion of the monument opening. The rest of the photos – JS. 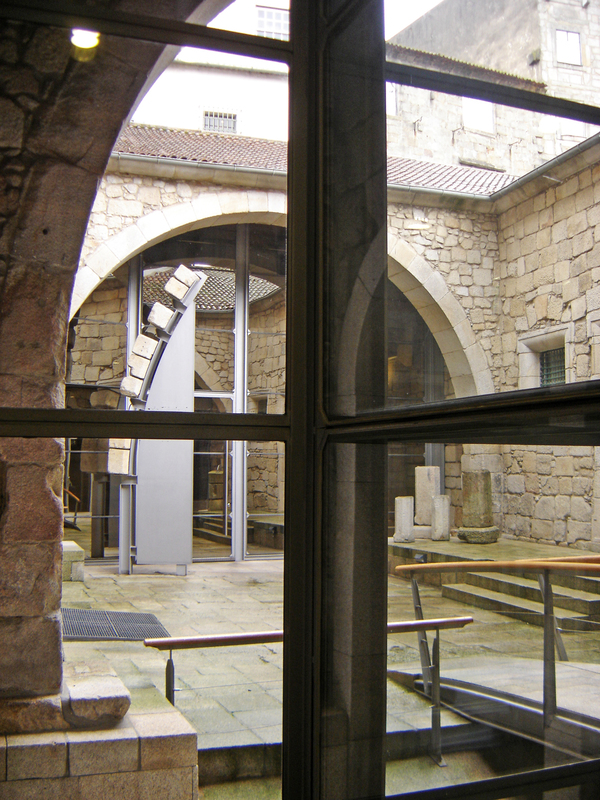 How rewarding was my recent visit to Casa do Infante, presently the Historical Archives of Porto! Rewarding for two reasons: the form (an example of an architectural intervention with a great deal of sensibility), and the contents (possibility to find out so much about the city’s long history and urban development via the permanent exhibition, as well as enjoying temporary exhibition on German architecture of the 1950s). 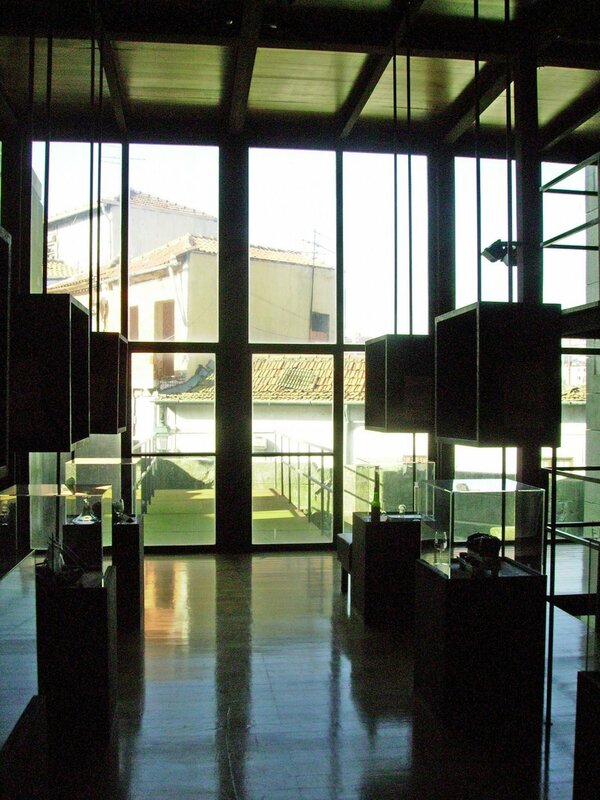 Numerous transformations, all shown within the exhibition, have marked this building complex, dating from the 14th century. It is important to mention that it has much older structures underneath, duly researched and also duly displayed. The most important inhabitant of the house was D. Henrique (born there in 1394), a crucial character in the history of Portugal and its age of discoveries. 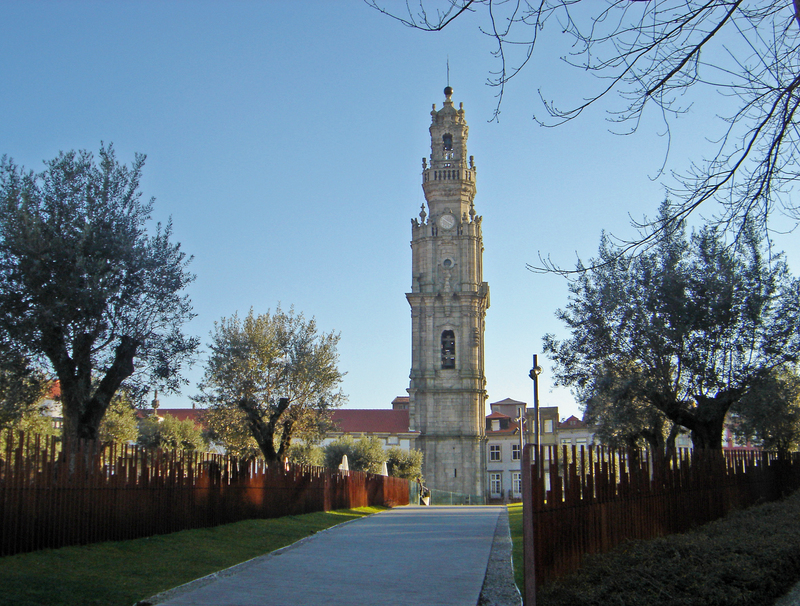 The latest restoration/transformation project, between 1998 and 2003, was lead by Nuno Jennings Tasso de Sousa (also well known for his design of the Faculty of Philology of Porto). Revisiting the previous intervention of Rogério de Azevedo from the 1960s, Tasso de Sousa implemented more contemporary understanding of conservation principles, exposing the historical layers of the house for educational purposes, introducing all the many contemporary elements needed for a state-of-the-art archives and respecting the principle of reversibility at all times. There is a lovely term he used to describe the intervention: that of “diachronic reading”. And just to have an idea of the scope of work, the total area remodeled amounts to 7869 m2. 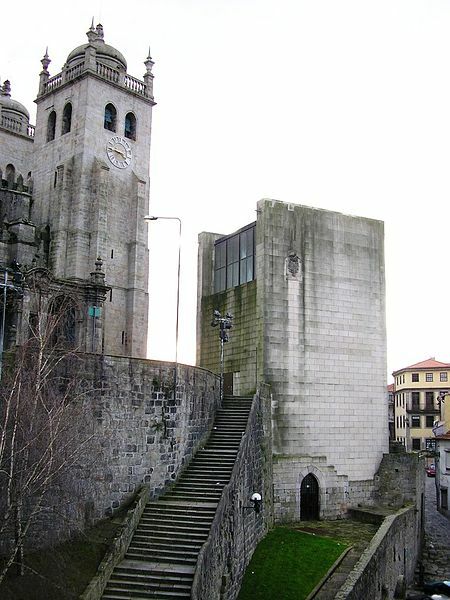 Torre da Sé in Porto. Hereby I present another discovery from the yesterday’s historical city tour – the Torre da Sé, designed by Fernando Távora in late 1990s-early 2000s (to be precise, between 1995 and 2002). 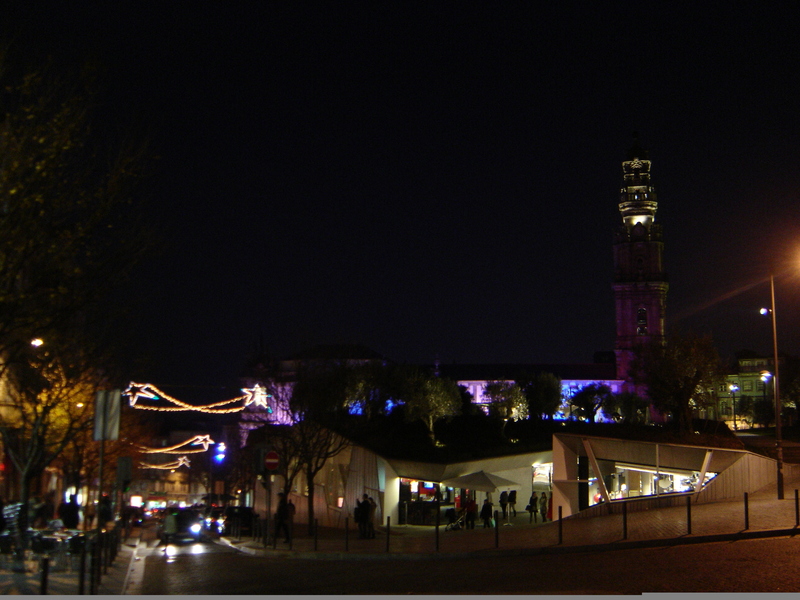 The tower is situated in the very heart of the historical city – just next to the cathedral. And it doesn’t lie about its epoch: it is unmistakeably contemporary addition to the continuity of the Porto’s history of architecture. The main materials are granite (so, the traditional stone building was reinterpreted and continuity established) and glass (to provide a sense of our own epoch and also reinforce interaction, since the tower is meant to be a public space). This kind of intervention is probably among the most demanding and sensitive tasks for an architect. And I think he did it with a success, maintaining his own identity as an author, yet being highly sensible to the historical values of the environment. 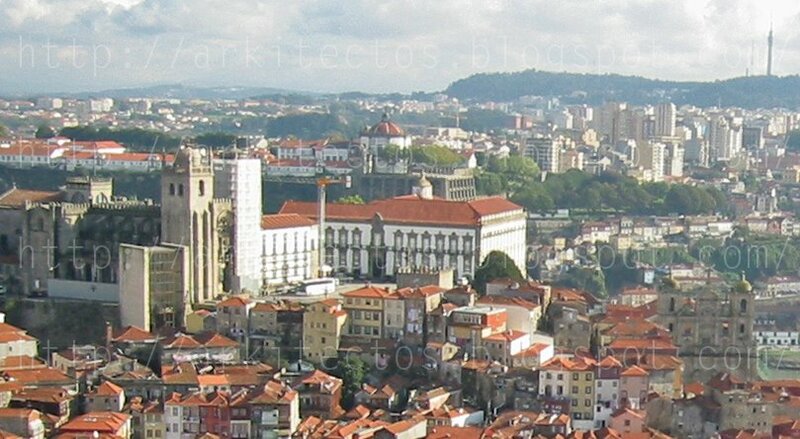 The tower was actually built on the ruins of an ancient building, the so called Casa dos 24, upon a call from the then mayor of Porto, Fernando Gomes. 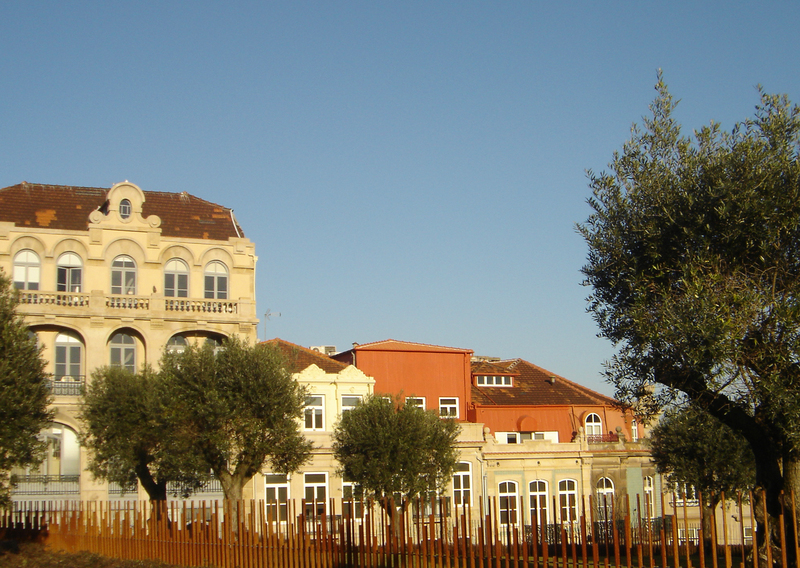 Casa dos 24 – because it is where the 24 local officials used to gather. 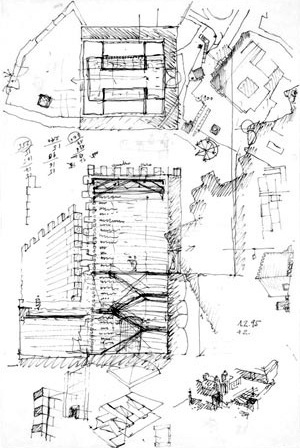 The proportion system of the tower emerged from the interpretation of an old text containing the description of the previous building. The main unit is “o palmo”, which amounts to 22 centimeters. So, the tower is 100 palmos tall (22 meters, that is), the walls are exactly 5 palmos thick (110 cm), and its length and width amount to 50×50 palmos, that is 11×11 m. Of course, the interior system of measures also conforms to this palmo module. One more curiosity: the Távora’s building does not have any particular function, but to enable visual experience and enjoyment of the city! Btw, FT lived between 1923 and 2005, he was a very important figure in Portuguese architecture and rethinking relations towards the past, so I’m sure there will be more posts about him here.